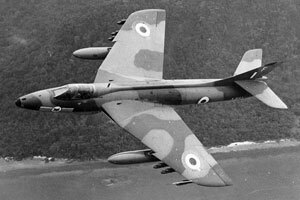 Hawkers worked on a number of designs for jet fighters after the war and the Hunter would follow on from the Sea Hawk via another design, the P.1052. 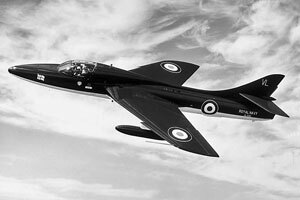 Basically a swept-wing Sea Hawk, the P.1052 looked promising enough to be considered as a Meteor replacement but other designs looked to be even better. One such was one born from Air Ministry specification F.3/48, the Hawker P.1067. Designed by Sir Sydney Camm, designer of the Hurricane and Sea Hawk, the P.1067 was his attempt to meet the earlier F.43/46 specification, which was then discarded and replaced with F.3/48, which was written to match the P.1067. To be armed with four 30mm cannon and powered by the then-new axial flow turbojet, three prototypes were to be built, two using the Rolls Royce AJ.65 (Avon) and one using the Metrovick F.9 (later known as the Armstrong-Siddeley Sapphire), in case the AJ.65 development ran into problems. The cannon were to be in a single unit complete with ammo, enabling quick re-arming by simply winching the pack down and replacing it with another. WB188, the first P.1067, September 1951; Hawker Aircraft Ltd. Detailed design began in late 1948 but it was not until early 1950 that Hawkers were ready to proceed with constructing a prototype. Receiving an order for 400, split equally between Sapphire and Avon powered aircraft, construction of the prototype began and by early 1951 the aircraft was ready for ground tests. Neville Duke, Hawker's chief test pilot, began taxiing trials at Boscombe Down and the first flight of the P.1067, serialled WB188, was on the 20th of July, 1951. After a number of flights out of Boscombe, the prototype returned to Hawker's home airfield at Dunsfold where development flying began in earnest. September saw the aircraft's appearance at the 1951 Farnborough SBAC show, and in April 1952 Duke took the aircraft through the much publicised 'sound barrier' for the first time. With two more prototypes joining WB188, the project became a 'super priority' one with production accordingly accelerated. The first production F.Mk.1 flew on the 16th of May, 1953, but this and a further 22 early production aircraft were used for development purposes. Like Supermarine's troublesome Swift, problems began to arise. The use of the flaps as airbrakes turned out to cause a severe nose-down pitching at high speeds, and after much work a simple hinged brake was fitted to the fuselage underside. However even this was troublesome and had to be disabled when the landing gear was down. Cannon firing was restricted to low altitudes because exhaust gas from them could cause the engine to flame out. The Sapphire engined variant, the F.2, did not suffer from this. Another cannon problem was that of spent links being ejected and tumbling along the lower fuselage causing much damage. Bulbous link collectors were fitted from the F.4 onwards, being added to earlier marks too. These were known as Sabrinas after a well-endowed pin-up girl of the time! 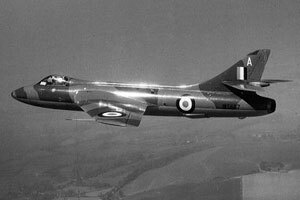 The Hunter F.1 entered RAF service with 43 Squadron in July 1954, replacing their Meteor F.8s. The F.2 followed in November, equipping 257 Squadron. Strangely the Sapphire-engined F.2 order was cut back, despite it not having the flame-out problem. Both variants were also short on fuel, something Hawkers were looking at with some concern. With gun-firing and range issues, both the F.1 and F.2 were basically useless as weapons of war, something the RAF did their best to cover up at the time. While work on the F.3, a one-off high speed variant with reheat, was underway, the F.4 entered service with 54 Squadron in March 1955, replacing their F.1s. The F.4 had more fuel and strengthened wings, enabling carriage of various air to ground stores including bombs and rockets. With the increased fuel load, the pilots of 54 Squadron began competing with each other to see how long a Hunter could stay airborne, and the record got to 1 hour and 25 minutes before the CO stopped the competition - that particular pilot having landed with dry fuel tanks, taking things a little too far - the previous year a pilot had been killed after running out of fuel in an F.1. Despite the poor fuel load of the Hunter, no inflight refuelling capability was ever added, though it could have greatly benefited from this - once again the UK government's bean counters handicapped a UK aircraft for no good reason. The F.5 also entered service, a month earlier than the F.4, with 263 Squadron. The F.5 was similar to the F.4 but Sapphire-powered, like the F.2, and was the first variant to see active service, being deployed against ground targets in Egypt during the Suez campaign. None were lost on missions but two were destroyed on the ground at Cyprus by EOKA terrorists. Hunter deployment accelerated, with the aircraft replacing the Sabres, Vampires and Venoms of Fighter Command and RAF Germany. No less than 19 squadrons operated the Hunter in 1957, by which time the F.6 was beginning to replace the F.4s and F.5s. This variant was higher-powered and one of the problems this caused was a pitch-up at high speeds, not unlike the Swift. This was cured by extending the leading edges of the outer portion of the wing, giving the dog-toothed look of later variants. F.6s could also scramble more quickly as they used an AVPIN starter system, enabling quicker engine spool-up than the cartridge-started early variants. With better performance at altitude, the Hunter was now able to hold its own with most of its contemporaries and could intercept bombers such as the B-45 and Canberra - but the V-bombers were entering service and these could climb above a Hunter's reach. More advanced fighters such as the American's F-100 could also out-perform a Hunter in many ways, so its day as an fighter/interceptor were numbered. A number of aerobatic teams operated the Hunter, most famously 111 Squadron's 'Black Arrows' and 92 Squadron's 'Blue Diamonds'. 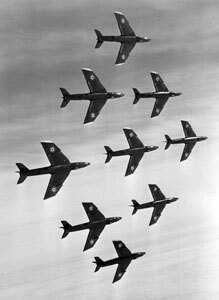 The Black Arrows amazed the aviation world in 1958 by looping 22 Hunters in formation at Farnborough - a feat never equalled or beaten since. A two-seat trainer variant, designed as a private venture, was based on the F.4 despite the F.6 with its more powerful engine being available. The first T.7 protoype flew in July 1955 and appeared at the 1955 Farnborough show two months later. While generally similar to the single seaters, the cannon pack was deleted and replaced with a single 30mm cannon fitted to the starboard side. The T.7 had a troubled gestation, with speed being limited to mach 0.88 until the canopy fairing was redesigned. A brake parachute was first fitted to the T.7, in an extended fairing over the top of the jetpipe. The first T.7s entered service with 229 OCU in July 1958. Some twin-seat Hunters entered service with the Fleet Air Arm, being fitted with arrestor hooks (for airfield use only) and designated as T.8s. The T.8B and T.8C followed, with improved navigational equipment, guns deleted and Harley lights added in the nosecone. The Hunter settled in for the next five years as the RAF's foremost air defence and ground attack aircraft, and Hawker completed their one-off F.3 variant. This was actually the original prototype with a new sharp nose, canopy, Avon RA.7R with reheat and airbrakes either side of the rear fuselage. Painted in a brilliant red colour scheme, the aircraft was then used by Neville Duke to set a number of records, including the World Absolute Speed Record on 7th September 1953 - achieving a speed of 727.6 mph off the Sussex coast. Despite this no further work was carried out on producing a production version of the F.3. 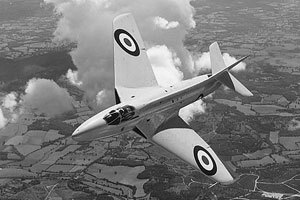 However, by 1963, the fully supersonic missile-armed Lightning was entering service and the Hunter's RAF day fighter role was at an end. The Blue Diamonds briefly teamed up with the upstart Lightnings of 74 Squadron to put on what must have been a truly awe-inspiring performance at the 1961 Farnborough show. From now on the Hunter's job would primarily be that of ground attack, and the next variant was accordingly the FGA.9. With further strengthened wings, provision for greater external fuel carriage (first tested by Hawkers back on the F.4 but only now accepted by the Air Staff) and increased oxygen supply, the variant also included the T.7's brake parachute. The FGA.9 entered service with 8 Squadron in January 1960 and soon equipped a number of squadrons. Further action for the Hunter came in attacks against dissident tribes and rebels in Aden, and attacks against Indonesian terrorists in Borneo. In 1968 it was the RAF's 50th birthday, yet the top brass did not se fit to mark this with any flypast, choosing instead for mere parades on the ground. Many RAF personnel were less than impressed and one Flt Lt Alan Pollock of 1(F) Squadron decided to mark the occasion in style - first with toilet-roll bombing missions against rival squadrons, and then on April 5th, while suffering from the beginnings of pneumonia which no doubt had some affect on his decision making processes, he flew his Hunter over London and at the last second decided to fly under the top span of Tower Bridge! Knowing of the consequences of his unauthorised trip, he proceeded to beat up several airfields and landed to meet his fate. It would be the end of his RAF career (he went on to run a successful exporting company), with political influences making sure he was treated incredibly unfairly - thrown out of the RAF with no right to appeal, no court martial at which he could present his case, medical evidence ignored, unable to meet with his superiors, etc. It took until 1982 for his case to be fully heard, and only then was he exonerated. Coincidentally, that same year the Hunter he had flown (XF442, which had been sold to the Chilean Air Force) was written off in an accident. Next up was the FR.10, a reconaissance version used largely in RAF Germany, replacing the highly-thought of Swift FR.5s and doing just as well in NATO competitions. The FR.10 had also been used in the Far East, using cannon only in many attacks. The Fleet Air Arm extended their use of the Hunter to acquiring a number of single seaters, these being the GA.11 (with Harley light in the nose) and PR.11A (with cameras in the nose), though these were mostly operated by the civilian Fleet Requirements and Air Direction Unit (FRADU). The GA.11s were used for mock attacks against RN warships, the light in the nose being used to initially train gunners in how to track high speed aircraft. By 1970 the FGA.9 and FR.10 were leaving service, being replaced by a mixture of Buccaneers, Phantoms and Harriers, but this wasn't the end of the Hunter's use in the RAF or RN. As late as 1979, a new variant arrived - the T.8M. This was a T.8 given a Sea Harrier's nose and was used to train pilots for the then-new Sea Harrier FRS.1, particularly the use of the Blue Fox radar. A small number of T.8Cs had transferred to RAF service with the loss of the RN's carrier-borne Buccaneers in 1978, and these continued in use with RAF Buccaneer squadrons until that aircraft's retirement in 1994. A T.12 variant had been on the cards, to train TSR.2 crews, but with that aircraft's cancellation the T.12 was dropped, the single example produced being used for a variety of purposes by the RAE, including fly-by-wire developments and aerial surveys. 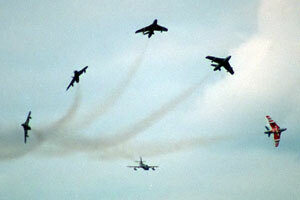 But all this is just the use by the UK - which doesn't even begin to compare with its use by foreign air forces. Hawker had created perhaps one of the UK's greatest defence export successes - no less than 19 countries operated the Hunter, with production under licence being carried out in Holland and Belgium. The Dutch operated F.4s, F.6s and T.7s, beginning in 1956 and retiring them in 1968. Belgium also operated F.4s and F.6s from 1956 onward, but had no trainers - instead they used Dutch ones in a cooperative effort. Belgium retired the Hunter in 1963, though many were retired in 1957. Replaced by the F-104 in Dutch and Belgian service, as many of the Belgian examples had retired very early, they were in excellent condition and Hawker bought many back to sell once more. Sweden operated the Sidewinder-equipped F.50 (designated the J-34 by the Swedes however) from 1955 to 1966, replacing it with the SAAB Draken. Denmark operated the F.51 and a small number of T.53s (similar to the T.7 but with F.4-style wings rather than the F.6 ones) from 1955 to 1974. Switzerland proved to be a more long-lived Hunter operator, flying their F.58s and T.68s from 1958 until 1995! The F.58 was essentially an FGA.9, but with Sidewinders and enlarged Sabrinas holding chaff and flare dispensers. Most famous of the Swiss Hunters were those of the national aerobatic team, the Patrouille de Suisse. Many of the team's aircraft are still flying in private hands now. India made extensive use of the Hunter F.56(A) and T.66(D/E) from 1957 to the early 1980s, being the first export customer of the type, and continued to operate a small number for target towing duty until 2000. Participating in the 1965 and 1971 conflicts with Pakistan, the Hunter proved to be a formidable ground attack aircraft and took a heavy toll of Pakistani armour. However in the air to air role the Hunter did not come off too well in combat with Pakistani Sabres, with 8 being lost in the 1965 war compared to 6 Sabres being shot down by Hunters. Pakistani pilots were lucky in that most of the Hunters they encountered were bomb-laden and operating at extreme range, and much easier prey as a result - especially when Sidewinder AAMs were employed by the Sabres. When encountering Hunters configured for air defence, they did not do so well but wisely dragged Hunters into low level, low speed turning dogfights, where the Hunter's performance was closest to the Sabre, instead of engaging at higher level where the Hunter would have been far superior. A single Pakistani F-104 finding itself in combat with a Hunter eventually had to disengage when the pilot found himself unable to turn with the Hunter. In the 1971 war the Sabres did not do so well. While six Hunters were lost, eight (possibly nine) Sabres were claimed by Indian Hunters (Pakistani sources accepting fewer losses but not by any great margin). A further three Hunters were lost to MiG-19s and four to Mirages - while some have doubted the quality of the Indian pilots' air-to-air training, the Hunters were once again largely configured for ground attack and faced with missile attacks; to have done as well as they did in the circumstances is an indication that good training was not something the Indians were lacking! More peacefully, Singapore employed the Hunter from 1970 - FGA.74s, FR.74A/Bs and T.75(A)s, forming the newly independent island's Air Defence Command. Moving to the Middle East, Hunters were operated by a number of air forces. Abu Dhabi had the FGA.76, FR.76A and T.77 from 1970, being replaced by Mirage 5s. Qatar had the FGA.79 and T.79 from 1969, being replaced by Alpha Jets in the mid 1980s. Saudi Arabia operated a small number of F.6s and T.7s from 1966 to the mid 1970s as conversion trainers for students transitioning from the Jet Provost to the Lightning. Kuwait had the FGA.57 and T.67 from 1965, initially being replaced by the Lightning but soon coming back into use when the Kuwaitis had problems with the complex Lightning. By 1977 the FGA.57s had been replaced by A-4KU Skyhawks, but the T.67s continued in service for a few years after that point. Lebanon operated the F.6, FGA.70(A) and T.66C for a short time, some ending up being destroyed, mostly by Israeli strikes. Jordan operated F.6s, FGA.9s, FR.73Bs and T.66Bs from 1958 until 1974, and their Hunters were the first Arab aircraft to attack Israeli territory in the Six Day War; however they were badly outclassed by Israeli Mirages in the air and most were destroyed in airstrikes on their bases. The few survivors of Israeli attacks were finally replaced by F-5s. Oman ended up with around 30 Hunters, ex-RAF, ex-Kuwaiti and ex-Omani examples among those operated from 1975 to the mid 1980s, being replaced by Jaguars. Iraq also operated the Hunter, one of its unfortunate uses being the dropping of poison gas on Kurdish civilians. F.6s, FGA.59(A/B)s and T.69s were used from 1958 to the mid to late 1980s, being replaced by Su-7Bs and Su-20s. South America also had a couple of Hunter users, these being Peru (F.52 and T.62) from 1956 to 1980 (replaced by Su-22s) and Chile (FGA.71, FR.71A and T.72) from 1966 to 1996. In Africa the Hunter was operated by Kenya (FGA.9 and T.81) from 1974 to 1979 and Rhodesia/Zimbabwe (FGA.9 and T.80) from 1963, being replaced by F-5s in Kenya and partially replaced by Hawks in Zimbabwe. Zimbabwe's Air Force's remaining Hunters are now suspected to be all grounded by lack of spares. The Hunter was operated by the UK's Defence Research Agency and the Empire Test Pilots School until 1999 and India retired hers in 2000. However in 2007, the Hunter came back into UK military use when a pair were returned to the military register for defence simulation and trials work. The Lebanese Air Force had stopped flying their remaining Hunters by 2005, but returned a small number to service in 2008. So it seems the Hunter finally beat the Canberra's record of 50 years in active service! Needless to say many also fly in civilian hands and have been regular airshow performers. Sadly in the UK, the Hunter's days in civilian hands seem to have come to an end due to the bizarre CAA grounding of the type after the 2015 Shoreham Airshow disaster, where a Hunter crashed outside the show venue causing multiple fatalities on the road. Despite no apparent defect in the aircraft, the CAA kept the initial grounding order in place throughout 2016 and as a result the remaining flyable examples are fast being disposed of to overseas buyers. 8 Jul 1955 3 Mar 1958 ? 3 July 1959 7 Nov 1959 ? ? 7,425 lb RA.7 Avon 122 10,050 lb RA.28 Avon 207 ? ? 603 knots at sea level, 0.92 mach As T.7 As T.7? As F.6 ? 47,000 ft ? ? As F.6 ? 13,360 lb 13,482 lb ? 13,010 lb 13,100 lb As F.4 ? 17,200 lb ? 18,000 lb 18,090 lb As F.4 ? As F.4 As T.7 As F.4/F.6/FGA.9 As F.6/FGA.9 ? As F.4 As T.7 ? As FGA.9 ? As there were so many variants, only the major UK and export variants are listed here; many variants differed little from previous ones, having only different equipment fits or minor armament variations. The major export versions have a country listed underneath their designation, but this was in most cases not the only customer to use the particular mark, particularly due to the moving around many of the airframes did. Production totals for each variant include converted airframes and are not limited to the main operator, e.g. the FGA.9 totals include Rhodesian examples. Corrections and gap-filling welcome as always!